The rally marked further fallout from the explosive law that critics say marginalizes the state's non-Jewish citizens. TEL AVIV, Israel — Members of Israel's Arab minority led a mass protest in central Tel Aviv on Saturday night against a contentious new law that critics say marginalizes the state's non-Jewish citizens. The rally marked further fallout from the explosive 'nation-state' law and came a week after thousands of Druze, also members of the Arab minority, packed the same city square. Israel's 1948 declaration of independence defined the country as a Jewish and democratic state and the government says the recently passed bill merely enshrines the country's existing character. But critics say it undercuts Israel's democratic values and sidelines the country's non-Jewish population, namely the Arab community that makes up 20 percent of the country. One clause downgrades the Arabic language from official to "special" standing. Israeli media reported tens of thousands of Jews and Arabs attended the protest. Some Arab protesters waved Palestinian flags and others held signs reading "equality." Some knelt and preformed Muslim prayers. Prime Minister Benjamin Netanyahu posted footage on Twitter of protesters waving the Palestinian flags. "No better testament to the necessity of the Nation State law," he wrote. Ayman Odeh, an Arab member of the Israeli parliament, told The Associated Press: "This is the first time that tens of thousands of Arabs have come to Tel Aviv with Jewish democratic groups. They came to say this is not the end of the demonstrations, but the first serious demonstration against the Nation State law." 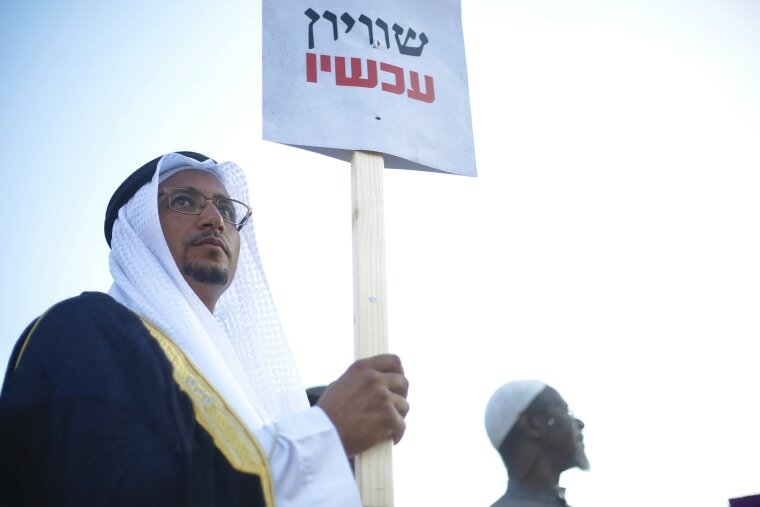 "This law is against us, against the Arabic language, against peace, against our future in this land, we are the real people of this land, we can't agree on this law," he said. Israel's Arab citizens enjoy full citizenship rights but face discrimination in some areas of society like jobs and housing. They share the ethnicity and culture of the Palestinians in the West Bank and Gaza Strip and often identify with Palestinian nationalism, rather than Israel. Deadly flare-up on Gaza-Israel border gives way to quiet. Will it last? Tens of thousands of Druze, also members of the Arab minority, packed the same square in the heart of Tel Aviv, Israel's cultural and commercial center, last week. The Druze are followers of a secretive offshoot of Shiite Islam and are considered fiercely loyal to the state and serve in Israel's military, unlike most of the country's other Arab citizens.